The UK Edtech 50 – what it is, how to get involved and have your say! The Edtech 50 is the idea of Ty Goddard from the Education Foundation and Edtech UK. I’ve been involved in some way shape or form with the Education Foundation ever since they kindly hosted my book launch for ‘Perfect ICT Every Lesson‘. I first met Ty Goddard and Ian Fordham at the Festival of Education at Wellington College back when they ran the Education Foundation together. They had just been involved in some great work with Facebook creating a user guide and a whole bunch of brilliant resources for teachers and schools in and around the use of Facebook. Who are EdtechUK and what is the #edtech50? Move forward a few years and Ty Goddard and Ian Fordham started the EdtechUK organisation. Its aims were and still are, to promote teacher entrepreneurs and others from the UK, in the development of educational technology products to have an impact on schools and education. It’s Edtech Vision 2020 is a call to action from all stakeholders in edtech to come together to help raise standards in edtech by 2020. The Edtech Vision 2020 document is a contribution to policy development and growth of the UK’s education and learning technology sector. The Edtech UK vision contributes to the work of the ‘Building our Industrial Strategy’ throughout the UK. Part of that important work was to bring together stakeholders in education and education technology together from around the world for the Edtech Global Summit. Last year’s Global Summit at City Hall in London saw policymakers, teachers, thought leaders and more, come together from around the world to share their stories of success and failure. To talk about all of the big issues around successful conception, creation use and deployment of edtech from areas around the globe. 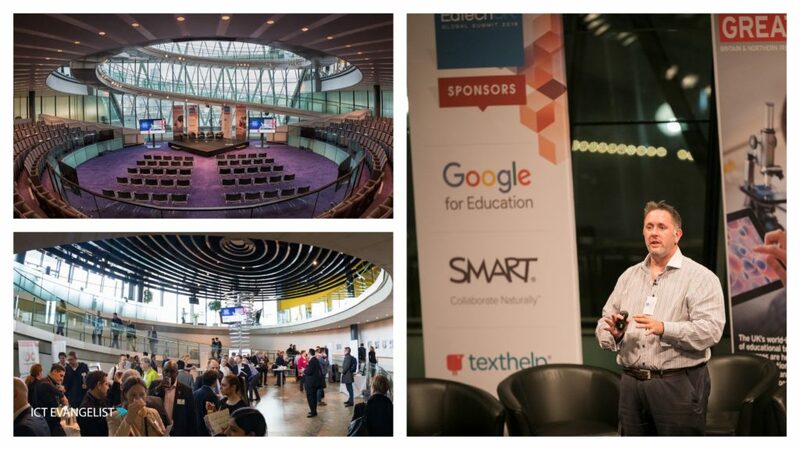 It was a real privilege to be asked by Edtech UK to be the closing keynote for that day. For those of you that don’t know City Hall, this is the same building that the two ‘Apprentices’ did their final pitch in during the final episode of this year’s season of ‘The Apprentice’. A year on and things have changed! 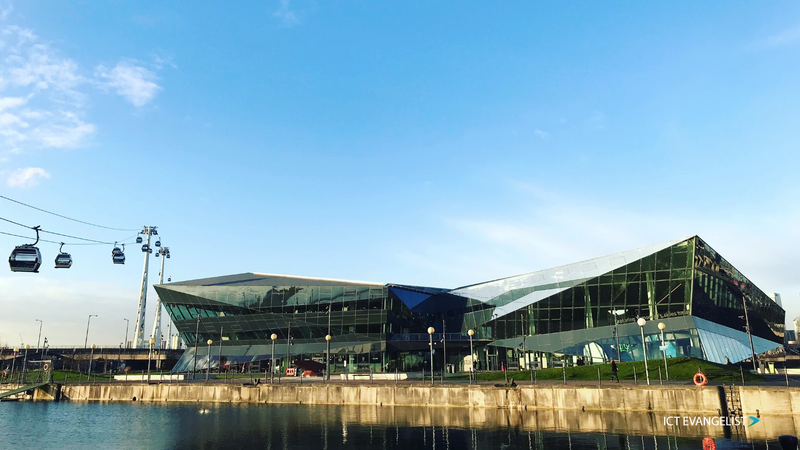 This year’s event took place at ‘The Crystal’ in London’s Docklands. Now flying solo due to co-founder Ian Fordham joining Microsoft in January as their UK Director of Education, Ty Goddard headed up a fantastic Global Summit at yet another amazing venue. With speakers from politicians to Government advisors, teachers, lecturers, Professors, you name it – there were some great stories and calls to action shared with the hundreds of attendees. The biggest of which was the call to action from Edtech UK and Jisc. EdtechUK in partnership with Jisc are working together to support and develop the British education technology edtech sector. Hundreds of teacher entrepreneurs, schools, businesses and startups are making innovations in this sector every day. 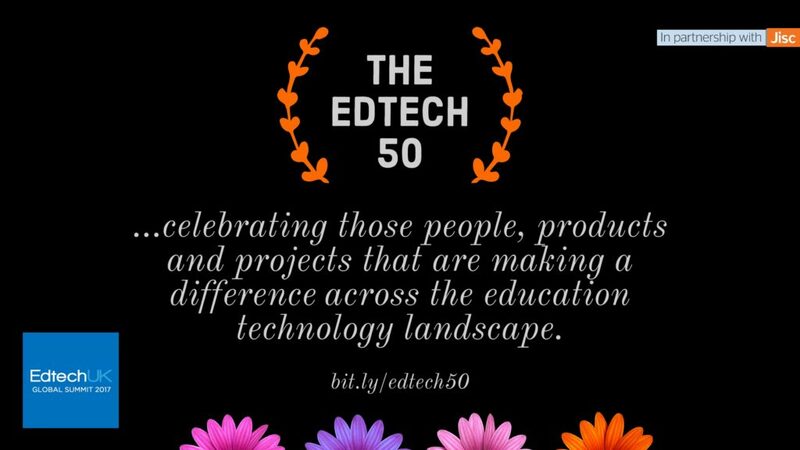 To help shine a light on those that are doing great things, EdtechUK created the Edtech 50. A means of finding and celebrating the best of what is happening in this vibrant sector. 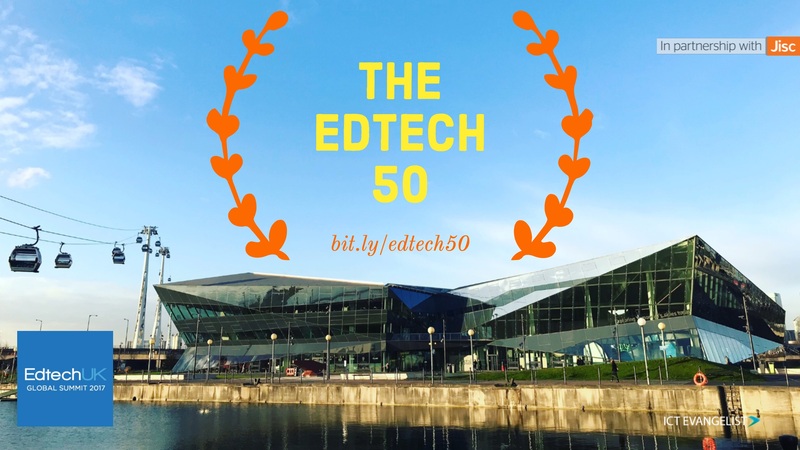 The aim of the Edtech 50 is that it will celebrate those people, products and projects that are making a difference and having an impact in this dynamic sector. How do I get involved and nominate? In order to be considered for the Edtech 50, all you have to do is nominate your favourite UK edtech products, people or projects that have made a difference to you in your school. It could be recognition of the brilliant ‘Rocket Fund‘ project from Nesta or the innovations in AR and VR being developed and shared by Curiscope. Why not give credit to teacher entrepreneur Rob Smith of Literacy Shed for his apps to help with spelling in the classroom? You decide. Add your nominations for the Edtech 50 here. I will be one of the judges for Edtech 50. Other judges include: Sky Caves (Basingstoke College of Technology), Sherry Coutu (Entrepreneur and Investor), Ian Fordham (Microsoft UK), Steve Frampton (Portsmouth College), Ty Goddard (EdtechUK) Martin Hamilton (Jisc), Claire Price (Headteacher), Dan Sandhu (Entrepreneur and Investor), Shahneila Saeed (UKIE), Bukky Yusuf (Teacher), and Mark Martin (@urban_teacher).